When using “sensorDidOutputSynchronizedDepthFrame(_ depthFrame: STDepthFrame!, colorFrame: STColorFrame! )”, the captured STDepthFrame’s depths are not synchronized with the color image (depth pixels do not align with the color pixels). The below image is the purple shaded STDepthFrame superimposed onto the color image. We can see the miss-match between the STDepthFrame and the STColorFrame. The shaded STDepthFrame was produced from a CSV of the STDepthFrame, loaded into an Excel file. The file has the depths in one sheet, and the object coordinates in another sheet. 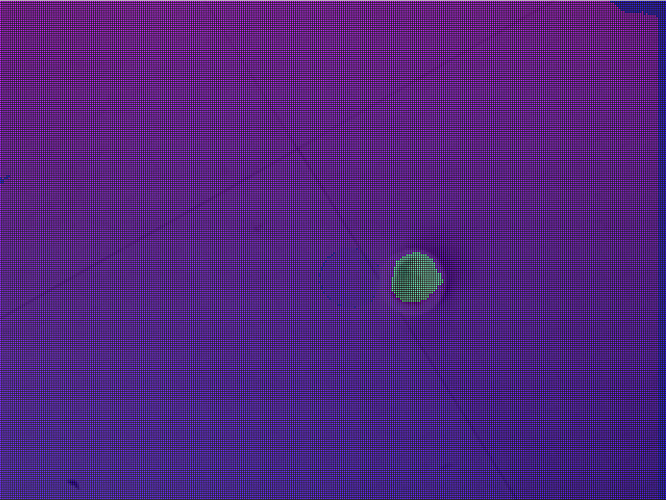 I ran a VBA macro to colour the cells of the depths in a shade of purple, and another VBA macro to colour in lime the cells of the object. They are not at the same pixels. The depth pixels of the object are visible by the shades of purple, but do not match the colour pixels of the object. How can we make sure both match? The scan occurred on a flat floor. printLine += "\(depthArray[currentPixel] / 10)) "
printLine += "line width \(i + 1)"
printLine += "\n dfHeight \(j + 1)"
No replies on this yet. I have looked into your example project 3D scanner with the three views. I noticed this method “registeredToColorFrame”. I am assuming that I might have to call this methods to “Return a version of the depth frame aligned to the color camera viewpoint” as the documentation suggests. Right? Yes, you will need to register the color frame and the depth frames together similar to what is seen on line 310 in the ViewController+SLAM.mm file in the Scanner sample application. Please also make sure that your Structure Sensor has been calibrated to the iOS device you are using with our Calibrator App.